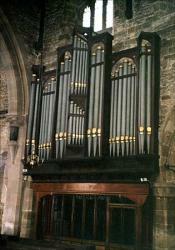 The present organ was installed in 1978 from the redundant church of St Edmund in Northampton. It was manufactured in 1886 by Hill of London. 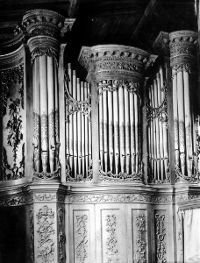 The previous "Pomfret Organ" was damaged by fire in 1976 and remains in the Victoria & Albert museum awaiting sufficient allocation of funds to permit its restoration. It was a highly ornamented piece of woodwork and was given by the Earl of Pomfret in 1817, and was originally in William Beckford's Fonthill Abbey. Transcript from the Northampton Mercury 14th Sept 1917. A correspondent sends us some interesting extracts from old Towcester records of 100 years ago. The organ to which the Right Hon. George Lord Pomfret refers in the letter given below was presented at the Parish Church in June, 1817. It was formerly at Easton Neston House, Lord Pomfret's seat. It did not appear to have been removed to the Church till 1818, probably on March 24th. It was then placed in the west gallery, a handsome old oak structure, where it remained until 1885. The church was then restored and all the galleries removed. The organ was then placed in the north aisle, where it stands at present. Lord Pomfret has received with heartfelt pleasure the vote of the Minister, Churchwardens, and the inhabitants of the Parish of Towcester in public vestry assembled on the 6th inst., and begs to express his most cordial thanks for that flattering token of their approbation of his Present, and at the same time assures them that he shall ever feel a lively interest in the prosperity of the Parish, and the happiness of every individual concerned with it. The churchwardens 100 years ago [ie in 1817 nearly 200 years ago. Ed.] were: P.Phipps, Parish Churchwarden, W.Inns, Minister's Warden, 1816-1817; Joseph Willsher, Parish Churchwarden, W.Drayson, Minister's Warden, 1817-1818. Charlotte of Mecklenburg-Strelitz (19 May 1744 to 17 November 1818) was the Queen consort of the United Kingdom as the wife of King George III. (Wikipedia).